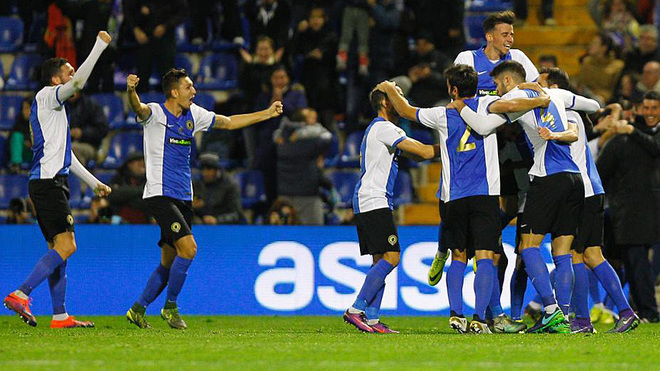 For the second match in a row Barcelona suffered to earn a 1-1 draw, this time in the Copa del Rey Round of 32 first leg against Segunda B side Hercules at the Estadio Rico Perez in Alicante. The home side deservedly took a lead in the 52nd minute through David Mainz, but Barcelona were able to answer thanks to Carles Alena, whose 57th minute strike salvaged some dignity from what was otherwise a dismal, lethargic performance for the guests. The red flags from Wednesday’s night’s contest, and those of the last few weeks, will surely be on the mind of Barcelona boss Luis Enrique as he makes his final preparations for Saturday’s Clasico against rivals Real Madrid. The Asturian opted to field a squad heavy on reserves and youth team players, with defenders Samuel Umtiti and Lucas Digne, midfielders Rafinha and Arda Turan and forward Paco Alcacer serving as the more experienced players taking the field. Hercules were perfectly content to sit back and defend and make Barcelona try to create opportunities, knowing that a Barcelona side without Lionel Messi, Luis Suarez and Neymar typically struggle under such circumstances. The hosts pressured Barcelona any time the Catalonians edged close to the Hercules area and cut off Barcelona’s passing lanes. Luis Enrique’s men did themselves no favours though; seemingly every time a Barcelona player was with the ball and surrounded by two or three Hercules players, there was little help arriving in the form of a teammate. Meanwhile, Hercules grew into the game and had a couple decent looks at goal. Perhaps with a bit more calm Gaspar would have not hurried his shot and could have beaten Barcelona goalkeeper Jasper Cillessen in the 28th minute. Three minutes before the break Hercules’ Rojas was left unmarked in the Barcelona area but spoiled the chance by heading wide. Overall, like in San Sebastian on Sunday, it was a first half to forget for Barcelona as evidenced by their scoring chances: An Alcacer free kick on 10 minutes was the lone shot on target from the visitors. The Segunda B side continued to impress at the start of the second half and were on the wrong side of a referee’s call in which Borja López brought down Gaspar on the edge of the area. Replays showed that it was slightly inside the box, but a free kick was whistled instead of a penalty and Gaspar’s resulting free kick was well saved by Cillessen. Hercules’ persistence paid off and they opened the scoring minutes later when a ball played in from the left skipped through the Barcelona area to the far post where Mainz met it and pushed the ball in past Cillessen for a 1-0 lead that sent the home fans into delirium. Barcelona were lacking ideas and needed something special to happen to answer the Hercules goal. It would come just five minutes after the hosts’ goal as Alena rocketed home a left-footed shot from distance that went swirling and buzzing past Hercules goalkeeper Ivan Buigues to level the score at 1-1 and give Barcelona a precious away goal. Despite the goal, Barcelona still struggled to mount a cohesive attack and Luis Enrique cut a forlorn figure sitting on the Barcelona bench as the final minutes ticked down with his team looking from the side that won the Copa last spring. 1.- Hercules: Iván Buigues; Dalmau, Fernando Román, Rojas, Peña; Inglés, Omgba, Gaspar (Chechu, min. 71), Juanma, Salinas (Minano, min. 71), Mainz (Berrocal, min. 80). 1.- FC Barcelona: Cillessen; Vidal, Umtiti (Andre Gomes, min. 69), Borja, Digne; Rafinha, Arda Turan, Denis, Carbonell (Nili, min. 69), Alena (Marc Cardona, min. 76), Alcacer. Goals: 0-1, min. 52: Mainz; 1-1, min. 57: Alena. Yellow Cards: Pena (min. 90). Jose Rico Perez (Alicante): Attendance, 20.000.